So you’ve got a bunch of files nicely arranged in a folder structure sitting on your computer or a network drive that you want to copy up to a SharePoint library and preserve the directory structure. On the surface this is a daunting task as you can’t just give SharePoint your folder structure and tell it to do the work for you, so what are your options. Recreate the folder structure in SharePoint and upload the files via SharePoint UI in batches doing a multiple file upload to one destination folder at a time. Not much fun for anyone, but it can be done. PowerShell is an awesome way to get things done quickly in SharePoint, I’ve written these scripts in the past that show you how to create folders and how to upload documents to SharePoint. With a bit of extension and effort you could roll your own scripted solution. Now this is my preferred option for getting the job done, and the reason for writing this blog post! To achieve this one, browse to your library in SharePoint and click on the sync button to have the SharePoint library sync’d via OneDrive to your local machine. 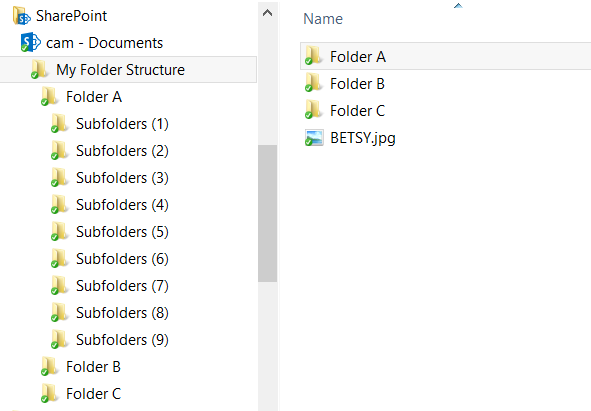 After the sync has completed the SharePoint library (and it’s content including any folder structure) is now represented as a folder structure that you can easily get to through Windows Explorer. Now it’s just a matter of copy/paste or drag/drop your local folder structure (that you want to copy to SharePoint) into this folder in Windows Explorer. 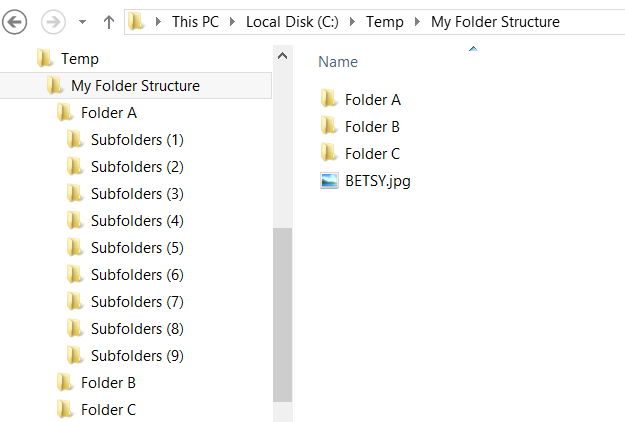 Here is my folder structure I want to copy up to SharePoint. So I can just copy the “My Folder Structure” folder and paste it into the SharePoint sync library location. This is super quick because it’s just copying between 2 locations on your local hard drive. Now the real goodness happens. OneDrive will sync the entire folder structure including any content files up to SharePoint in the background. You will notice that the folders and files you have just pasted have a tiny icon in the left corner. This will display a green tick when the item has been created in SharePoint. This is awesome, your computer is still free to use, there’s no lockup. If you need to shutdown before the sync is finished, it will just pick up from where it left off. OneDrive’s mission in life is to keep your local folder in sync with the SharePoint library, and it will work tirelessly in the background to do this. Another powerful advantage this method has over many of the other options I provided earlier is that it will work with Office 365 which you just can’t reach some of those other methods. Now my disclaimer before I get people throwing virtual rotten fruit at me. I’m not suggesting you use this method to move an entire network drive to SharePoint. Yes, I advocate you should take the opportunity to clean up the data on your network drives and not just move the problem to SharePoint. I also believe in the use of metadata to classify content rather than using folders. Having said that, there are valid instances when you do need to perform an upload of many files and preserve the folder structure in SharePoint and I think the OneDrive approach is a pretty cool tool to add to your arsenal.